Renowned sociologist Gary Bouma is one of most respected observers of religion in this country. He predicts that, by 2021, less than 50 per cent of Australians will call themselves Christian. In seeking to fill a mother's empty womb, Nobel Prize winning biologist Robert Edwards developed a solution. In so doing he confirmed what all innovators know: that progress doesn't occur in a neat and orderly vacuum, and nor should it be halted for fear of what it might produce. Lacking the wisdom of experience and anything resembling a positive adult role model, Owen is guided by a yearning for companionship and a budding adolescent libido. These are very human impulses, but no substitute for wise adult guidance or a fully formed moral compass. He had the emaciated cheeks of an addict. She was smaller, toothless and aged beyond her years. As we closed our gate he struck her. She fell on the bitumen, lit by the headlight of a passing car. 'You touch her and I'll belt you too,' the man yelled to my partner. No good deed goes unplagiarised; no noteworthy scheme leaves the department unharvested. Lack the intellectual capital to spend on an informed decision? Set multiple minions to work then cherry pick the outcomes, signing off with your own trotter. Last week the BRW Young Rich List appeared. Judging by the profiles that go with lists, listed people are a boring lot. They tend to take seriously activities that don't contribute much to human happiness. Many of the wealthy young made nothing, except a pile of money through property and hedge funds. I am the unwilling custodian of some very fine paintings that no one will ever see. Whenever Mr N wants to discuss aesthetics, or Matisse's brush technique, or surrealism, I have to remind myself that he killed his wife and step-daughter with a fruit knife. The Australian Anglican Church is divided on questions of women's ordination, sexuality, lay presidency and liturgical texts. But the recent assembly in Melbourne was relatively polite, although the question of the conservative, evangelical Sydney Diocese's relationship with the rest was never far from the surface. The financial crisis threatens to engulf them. But Money Never Sleeps is less interested in financial wheeling and dealing than the ways in which the lunges and plunges of the market impact upon the characters' lives and relationships. For those born in Adelaide, there is something endearing about the place. It's like living in a country town where Big Ears, Ratty or Mole could be spotted. But the penchant for nostalgia and for by-gone days is exactly the wrong impulse now for the City of Churches. If the Gillard Government manages to serve a full term, there is a good chance that Parliament will pass a well-designed, effective national carbon pricing policy into law in 2012. 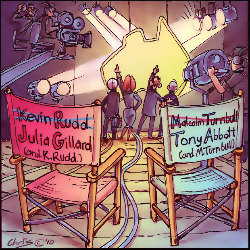 This would be a major policy success that Gillard could legitimately boast of going into a 2013 full-term election. Amid the horror and gloom there have been moments of inspiration in the flood crisis that have largely gone unreported. While they warmly accept the staples of relief, they know through a history of crippling food insecurity and mass displacement that they are masters of their own destiny. Groups concerned for asylum seekers are now faced with bad Australian policies on asylum seekers like the regional processing centre and a harsher regime of detention. They should reject the policies but cooperate with governments to minimise the harm caused to asylum seekers by them. Kevin Rudd and Malcolm Turnbull's past faults and misdemeanours have been forgotten and they have been charged with new responsibilities at the heart of Australia's domestic and international futures. The new leaders must wish their vanquished colleagues great success. But not too much.